1. Fuchka (and chot-puti which is basically the same ingredients but chopped up): It’s a street food. Small dough balls which are stuffed with a chickpea (garbanzo) salad made with jalapenos. Can be spicy. It is served with a tangy tamarind vinaigrette. There is usually the option to have this served not spicy which means the addition of a yogurt sauce on top. Many vendors mix a special black salt into the yogurt sauce. See #10 for a similar aroma. 2. Bhorta: the biggest secret food. It’s a style of “mashup” foods and other small dishes like mezze/appetizers/tapas. Best restaurant is in Old Dhaka but try to eat it homemade. 3. Rumali: This is my personal favorite because I like yeasty stretchy dough with grilled meat. “Rumali” means handkerchief so the bread is as thin as a handkerchief. 4. Jhalmuri: It’s a street food. A savory puffed rice treat usually served in a recycled paper cone (as in, you can read someone’s homework on the paper) with a paper scooper as a utensil. 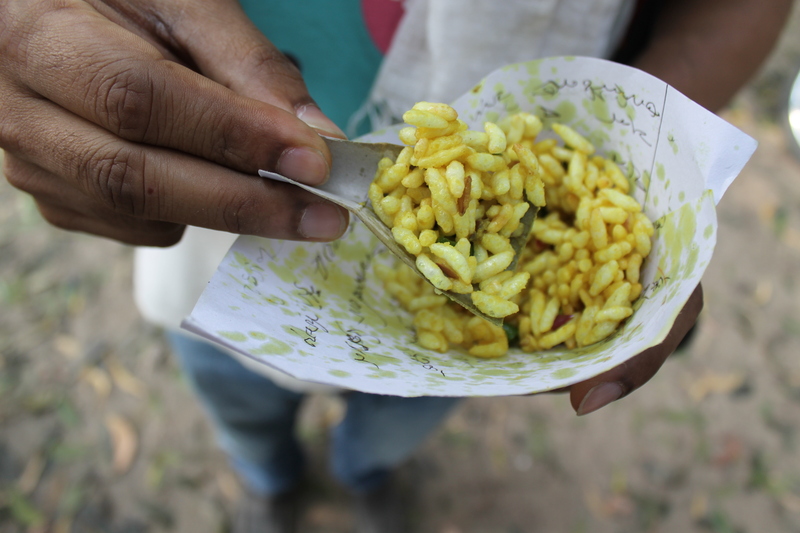 Puffed rice with flavoring called jhalmuri. 5. Sringara: A street food. Also, commonly served at parties. It’s a deep fried dough ball or triangle. Like a samosa. 6. Pithe: A biscuit with sculptured designs unique to the maker. 7. Hilsha: The national fish. April and Bengali New Year is the time to eat this bony fish. Bangladesh is a country of fish eaters. 8. Jallaby: Also a street food. It’s like a deep fried funnel cake cooled and soaked in sugar water. 9. Mishti doi: Sweetened fresh yogurt. The yogurt in Bangladesh is almost always fresh and made in clay pots which are tossed (ultimate earth to earth recycling). It’s funny because many expats will keep these clay dishes and the Bangladeshis don’t really understand why. 10. Bhorhani: It is a drink made from yogurt but it is mixed with “special black salt” which is sulfuric. This drink is often served at special events like weddings. The Bangladeshis say that the drink cuts through the fattiness of the biryani served at weddings. I didn’t like this drink but I do like lassi and most other yogurt based drinks. I’m just not a fan of the sulfur aroma. When in Bangladesh, also try the lime soda, fresh juices, fresh mangoes, and coconuts. I liked the lime soda because it was always served with sugar syrup and fresh squeezed lime — a good way to keep scurvy at bay! Of course, there are many that I did not include on my list: “black berries” which look like olives and are bitter in flavor. Rice cakes. Unripe guava is often served and you will see vendors selling these pale green fruit cut up with some spice on them. And so on (I’m not Andrew Zimmern so I’m not including only “bizarre” foods, but, you may not like all of them. I personally liked the unripe guava but found the black berries to be too bitter for me). Also, try the Faluda. 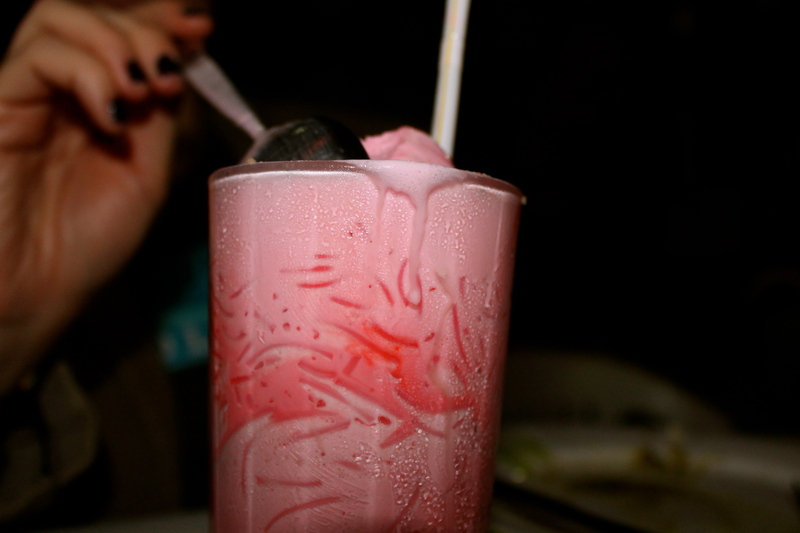 It’s a sort of milk shake dessert item with vermicelli noodles and super saccharine sweet syrup (see the photo of the pink milkshake?). Lastly, I always get asked if I get sick when I eat street foods or anything in Bangladesh. Follow your gut… food that sits out and reaches that dangerous (is it 58 F?) point where bad bacteria fester, should be avoided. Right? I was lucky but I also calculated my risks and I didn’t take that many. Usually, I let my Bangladeshi friends guide me. They always kept me safe. Oh, and if you are lucky, you will get to try many of these foods at weddings, including the biryani. Enjoy! The lines are the noodles in the Faluda. Reblogged this on Female Avenue. That’s almost always the way it is. But, I’m sure you’ve tried most of these!